It was finished two months early and $100,000 under budget. 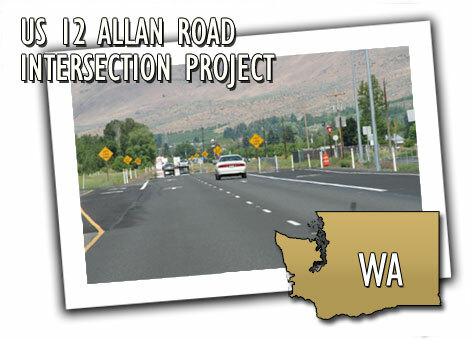 But best of all, a newly improved US 12 Allan Road intersection near Yakima, Washington, is safer for drivers turning on or off busy US 12. Granite Northwest of Yakima, Washington, began the project in March constructing acceleration lanes, deceleration lanes and turn lanes so that agricultural freight haulers and drivers can more safely enter and exit US 12 at Allan Road where a planned business park development is expected to increase traffic at the intersection. The overhead lights installed at the intersection are expected to reduce the risk of collisions by helping drivers see on-coming and crossing traffic from a greater distance. Design and construction of the safety improvement project totalled $613,000.